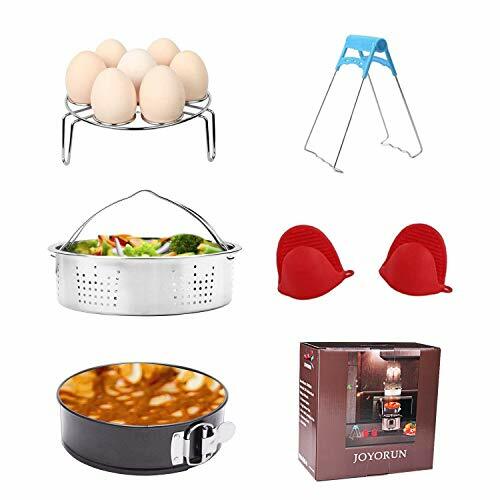 This egg steamer rack is an indispensable pressure cooker insert for many Electric Pressure Cooker users. If you have a baby, the steamer rack is perfect for steaming fruit and vegetables for making baby food. One of the healthiest cooking method is to cook with a steamer basket and rack because the food retains more flavors, nutrients, and texture. Tier stackable stainless steel insert pans allow you to cook a variety of foods simultaneously. Excellent choice for steaming vegetables,meat, and seafood. Doubles as a dessert pan to make cheesecakes or use as a lasagna pan. Reheat your food without losing its original flavor. It is also useful for storing food. This Instant Pot accessories has all you need in making the best meals possible. It serves as the best gift idea for loved and dear ones. PERFECT INSTANT POT SET-This is the best instant pot accessories set that will meet all you need. You will need to complete your instant pot cooking experience. If you have any questions about this product by JOYORUN, contact us by completing and submitting the form below. If you are looking for a specif part number, please include it with your message.